On a field in Dai Thinh Commune one summer afternoon, ducklings could be seen swimming next to a herd of nearly 30 cattle grazing on an unused piece of land. That plot of land and that ditch with water are in fact the site of a project by the Housing and Urban Development Corporation that has been in limbo for over a decade. If it had looked anything like in the project's blueprint, the ducks and cattle would be replaced by 15-story apartment buildings, a series of low-rise buildings, supermarkets, swimming pools, and parks. Me Linh District was touted as an "ideal living space" with urban areas, gardens and mansions to reduce the capital's population density, sending land prices soaring in the area. All over western Hanoi, we can now find such scenes of abandoned projects with herds of cattle grazing casually. Ha Dong, Hoa Lac, Thach That and many other places that should have become the new living spaces for Hanoians are now wastelands. Meanwhile, inside the city, 10 years after the proposed expansion, the streets are still crammed with people and vehicles. On La Thanh Road, the National Children's Hospital lies 100 meters from the Hanoi Obstetrics and Gynecology Hospital. Traffic could be blocked any time since all it takes is one taxi driving slowly looking for a fare. On Phu Doan Street where the Vietnam-Germany Hospital is located, pedestrians cannot even squeeze themselves onto the sidewalks since they have been turned into parking lots. 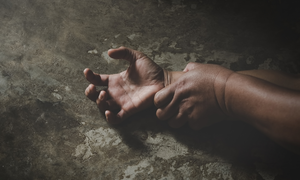 The air is filled with the sounds of sirens, of patients' vehicles constantly coming in and out, of security guards at the hospital's gate and on the street urging vehicles to move faster with their megaphones. Across the street is a row of eateries, general stores and street vendors. In the vicinity, three national hospitals are also crowded. Along the two-kilometer route between Xuan Thuy to Ho Tung Mau Streets is a massive construction site for the urban railroad but with its completion date nowhere in sight. This area is also home to five universities with tens of thousands of students, a slew of dormitories, shops, and markets. On one side on Giai Phong Street are the Universities of Science and Technology, Civil Engineering and of National Economics. 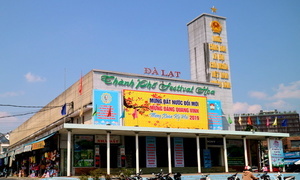 On the other are Bach Mai Hospital, Hanoi Heart Hospital, the National Hospital of Dermatology and Venereology and the National Otorhinolaryngology Hospital. Though there are always security guards and police officers in front of Bach Mai Hospital to maintain order and regulate traffic, the area is still jammed and suffocating. While Hanoi's boundary might have expanded, the implementation of plans for the capital to develop westward has not gone as expected. The government failed completely as it could not move its offices to their new locations as envisaged in the plans. Universities in the inner area were to have reduced their student numbers from 660,000 to 200,000 at most. Thirteen universities were supposed to have moved out of the inner area. But except for the National University's School of Law, which has relocated to Hoa Lac, the other universities are still there. Eight hospitals in the inner area were to be relocated, and new medical complexes were to be built in four suburban districts. Some of the hospitals have switched to new facilities and even opened them, but none has returned their original lands to the city. Many ministries and government departments have also refused to relocate their offices as planned. While the city has reminded them several times, only 10 out of 28 ministries and departments have relocated. 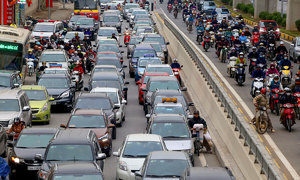 Schools, hospitals and government ministries and departments refusing to move have contributed to creating the disastrous traffic scenes. Yet, with the old solutions remaining unimplemented, authorities are already discussing a new solution: banning motorbikes. 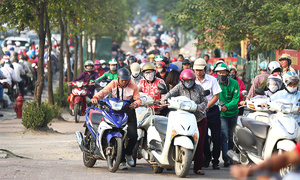 The city transport department is looking into trialing a motorbike ban on Nguyen Trai Street or Le Van Luong Street. 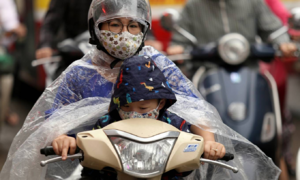 Two years ago, with over 91 percent of lawmakers approving, the city People's Council also passed a resolution on the management of private vehicles with the aim of banning motorbikes in the city by 2030. 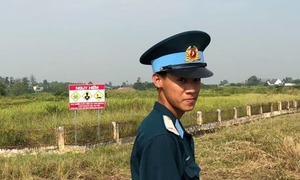 Hanoi has been unable to force government agencies to move to outer areas despite clear plans and unwritten orders from higher-ups. But the same administration is going to ban the people from using motorbikes in the inner area. 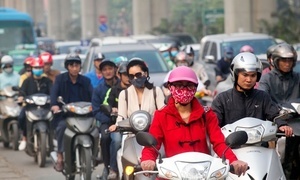 Motorbike users in Hanoi are in a disadvantageous position: There are interest groups above them that can be lazy and disdain plans, causing paralyzing congestion. Any motorbike ban, therefore, regardless of scientific bases, could spark off resentment. This reality is something like this: motorbike riders are easier to order around than hospital directors, university principals and leaders of ministries and departments. 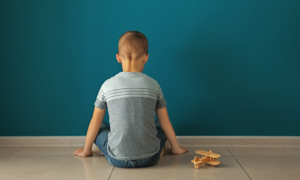 Option A was approved a whole decade ago but could not be implemented, so it is time for option B with a group of subjects who can be pushed around. 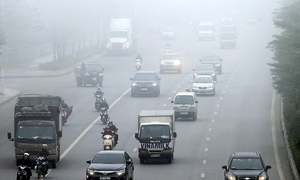 It is highly likely that the motorbike ban is completely warranted and eventually would need to be done anyway. But that’s plain logic. In a scenario where option A has stalled for a whole decade because of powerful people, forcing the ordinary man to change their livelihood plans so that a new option B could be implemented would render that logic meaningless, as all the people feel now is unhappiness. There’s one word to describe this: "bullying." 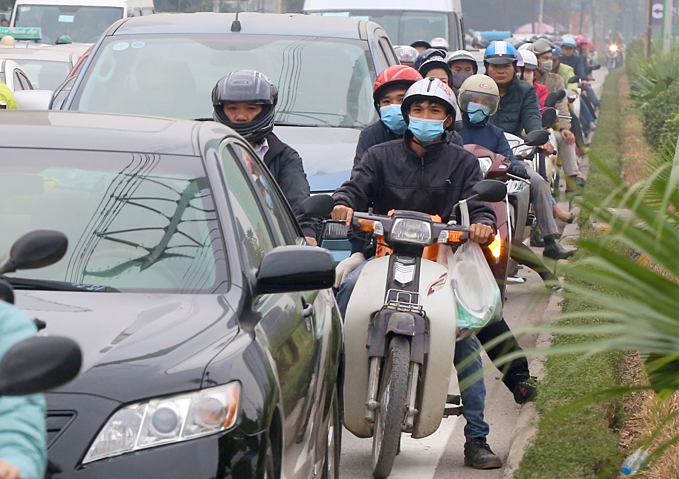 Hanoi authorities, and the government above them, should have done more with those that flout development plans before turning to forcing the people to obey a new rule. 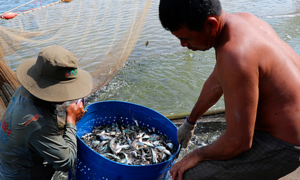 *Hoang Phuong is a journalist living in Hanoi. The opinions expressed are her own.